Young Adult Scavenger Hunt: TEAM GOLD! Welcome to YA Scavenger Hunt! 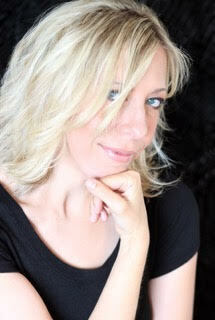 I’m Pintip Dunn, author of the upcoming YA sci fi, FORGET TOMORROW, and your host for this stop on the hunt. Go to the YA Scavenger Hunt page to find out all about the hunt. There are EIGHT contests going on simultaneously, and you can enter one or all! 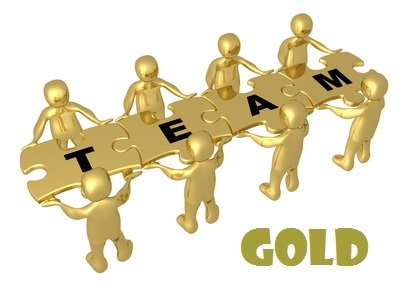 I am a part of the GOLD TEAM–but there is also a red team, a blue team, a green team, an orange team, a teal team a purple team, and a pink team for a chance to win a whole different set of signed books! Rules: Open internationally, anyone below the age of 18 should have a parent or guardian’s permission to enter. To be eligible for the grand prize, you must submit the completed entry form by Sunday, October 4,, at noon Pacific Time. Entries sent without the correct number or without contact information will not be considered. Today, I am thrilled to be hosting Laurie Stolarz! Laurie is the author of several popular young adult novels including Welcome to the Dark House, the Touch series, Project 17, and Bleed, (all published by Disney/Hyperion Books for Children), as well as the bestselling Blue is for Nightmares series (Flux Publications). With well over a million books sold worldwide, Stolarz’s titles have been translated into thirty different languages, been named on numerous award lists, including the Quick Pick for Reluctant Readers list and the Top Ten Teen Pick list, both through the American Library Association, and have been optioned for TV. Her newest book, Return to the Dark House, was released this past July. For more information, please visit her Web site at www.lauriestolarz.com. For Ivy Jensen, it’s the eyes of a killer that haunt her nights. For Parker Bradley, it’s bloodthirsty sea serpents that slither in his dreams. And for seven essay contestants, it’s their worst nightmares that win them an exclusive, behind-the-scenes look at director Justin Blake’s latest, confidential project. Ivy doesn’t even like scary movies, but she’s ready to face her real-world fears. Parker’s sympathetic words and perfect smile help keep her spirits up. . . at least for now. Not everyone is so charming, though. Horror-film fanatic Garth Vader wants to stir up trouble. It’s bad enough he has to stay in the middle of nowhere with this group-the girl who locks herself in her room; the know-it-all roommate; “Mister Sensitive”; and the one who’s too cheery for her own good. Someone has to make things interesting. Sometimes Nightmares Don’t End When You Wake Up. Don’t panic. Easier said than done. But ghosts, ghouls, killers, monsters, etc., etc., can smell fear. Only the strongest of mind survive. Get out. What’s that? The door won’t open? The knob won’t turn? Unlock the door. Sounds pretty logical, but if you’re in a house of horrors, you probably aren’t thinking straight. Read Rule #1, take a deep breath, and know that most doors lock from the inside. The phone line’s been cut? Your cell phone has no reception? The power is out. Is all of that not enough of a clue to heed Rule #2. Trust no one. Everyone’s a suspect. Be on guard at all times. Do you hear a creak/crack/whisper/rattle/jingle/jangle/pop/insert-your-favorite-creepy-noise-here coming from up- or downstairs? Do not go to investigate it. Simply ignore the noise and read Rule #2. Is that a Ouiji Board on the dining room table? Stay far, far away from it. And speaking of staying away… Steer clear of dolls. So what if they’re cute with smiling faces. If you’re in a house of horrors then they’re pretty much guaranteed to be evil. That little glimmer in their eyes is mere excitement for what will become of you if you don’t follow Rule #2. Something else to stay away from: clowns. Clowns are evil. Enough said. Don’t go up- or downstairs. Read Rule #2. Don’t ever assume that the killer is dead. These guys have nine lives. If he (or she) looks dead, it’s probably just a trick. Don’t ever assume that if you can’t see the killer, he can’t see you. He’s merely watching you from afar, studying your every move. Don’t take a shower. I know. This should be obvious, but we’ve seen enough horror movies where someone’s disrobing and hopping into a steamy shower, haven’t we? Something else that should seem obvious: while inside a house of horrors, do not engage in romance. The end result is never worth it. Pay attention to small children and animals. They’re super-intuitive with respect to ghouls and ghosts and know what they’re talking (or barking) about. While skulking around the house of horrors, should you learn that it was built on some sort of sacred burial ground, heed Rule #2.
c.Roll it into a ball and discard it without a word to anyone, wondering all the while how it got into your locker in the first place? e.Stuff it into your bag and throw it out later? You must’ve brought it to school unknowingly (maybe it belongs to a sibling). The red splotch could be from a paint or food spill. c.English literature, especially the works of Sylvia Plath and Virginia Woolf. What’s your go-to at lunchtime? School’s out. How do you get home?Someone’s picking you up. Spending the night in the Dark House amusement park is going to require physical endurance (and therefore proper hydration). From dodging the Nightmare Elf in the underground tunnels to swimming across a sea of flesh-eating eels…make sure you have a full bottle of water with a built-in purifier (in case you find yourself needing to refill). A good, strong rope is really key. From creating a ladder of sorts to climb up the gate that surrounds the park, to using it as a makeshift pole to slide down, out the window of Hotel 9, the possibilities are really endless. Imagine busting through the park gate, using the crowbar as a weapon or makeshift hammer, or prying open the doors of an underground crypt. A crowbar is a no brainer. The ability to spot the Nightmare Elf across the length of the park would absolutely give you an edge. While the amusement park itself is pretty well lit, what’s going to help you in those underground tunnels? We’ve seen duct tape used to make wallets, backpacks, wedding dresses, camping tents, and more. If only some of the Dark House Dreamers had brought along a roll of this wonder stuff on the night of their worst nightmares-come-true. While matches aren’t the most reliable (they can get wet, after all, while you’re trying to swim through a pool full of hungry eels), a lighter is a bit more steadfast. The lighter can be used to make a fire that can provide warmth on those cold amusement park nights. It can also be used to make a fire to signal for help. This one is pretty self-explanatory. A knife can be used as a weapon, a stake, a makeshift hammer, a screwdriver, or a shovel. It can also be used to cut fabric, food, wood, saplings, bandages, rubber, nylon, etc., etc. It can further be used to make the tinder (from bark) to ignite a fire. From digging oneself out of an underground grave, to using a shovel as a weapon to slay the Nightmare Elf, a shovel should be a staple. Don’t forget to enter the contest for a chance to win a ton of signed books by me, Laurie Stolarz, and more! To enter, you need to know that my favorite number is FOUR. Add up all the favorite numbers of the authors on the Gold team and you’ll have all the secret code to enter for the grand prize! 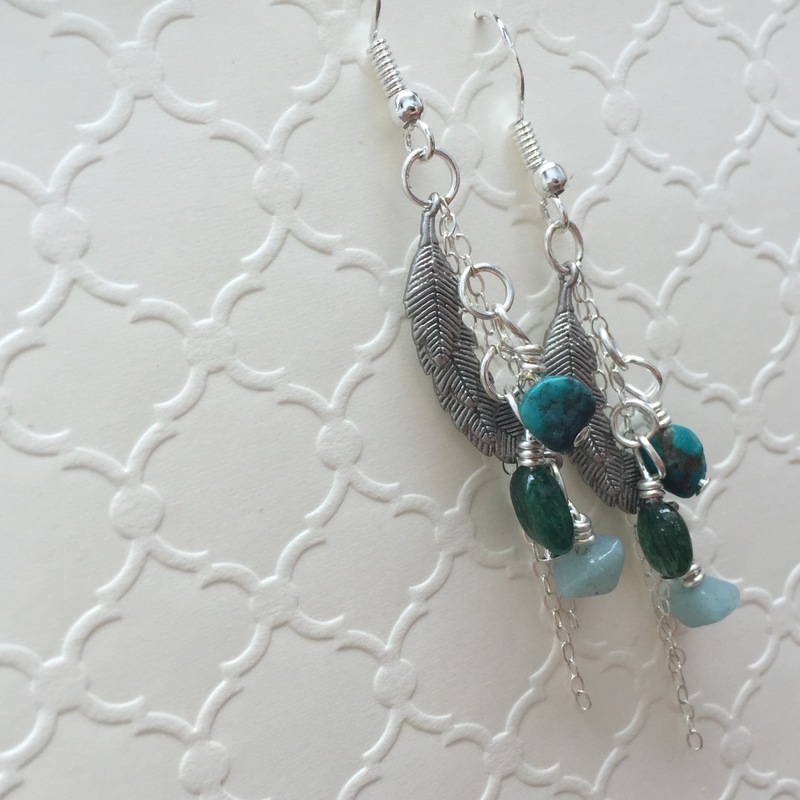 Before you go, check out this opportunity to win a pair of gorgeous earrings from me! A little background: I am OBSESSED with this jewelry store on Etsy, Two Pliers and Some Wire. Not only is the jewelry beautiful, but the colors remind me of the FORGET TOMORROW cover. So, I contacted the owner and asked if she would consider designing a piece inspired by my book cover. To my delight, she said, “yes”! What do you think? Stunning, right? I love these earrings SO MUCH. If you think they’re pretty awesome, too, and you’d like a chance to win, please click on the link to the rafflecopter below, where I’ve provided a ton of easy ways to enter. HAPPY HUNTING, AND THANKS FOR STOPPING BY! 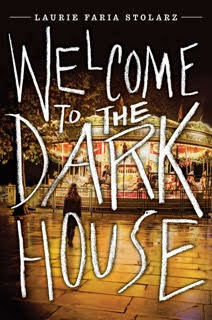 This entry was posted in Giveaway and tagged Custom-designed earrings, Laurie Stolarz, Welcome to the Dark House, YA Scavenger Hunt by pintipdunnwp. Bookmark the permalink. Honestly, I don’t think I’d send my younger self a memory – that might lead to averting one “disaster” but how many new “problems” might turn up around the corner once you change this one particular thing? You are very wise, Birgit. My characters have to learn this the hard way! Thank you for your comment! Aw, I love this answer!! It’s so sweet — and this way, you get the reassurance of knowing that you will fall in love, without ruining all of the fun! Thanks so much for your comment! Smart, to warn yourself of what’s to come. Thanks for your comment! I would not send my younger self a message no matter what because I would not be who I am today if future me visited past me. I know that if I visited my past self and talked to her, said anything at all to her, I would spend my entire life yearning instead of living it. This is very wise. I love what you said about “living” versus “yearning.” Thanks so much for your comment. Probably a memory of what happens when accidentally leaving birds out in cold weather. Then they would probably live a bit longer until I inevitably forgot again. Younger me was not a good pet owner. In fact, younger me would probably think it was indeed a vision of the future and therefore destiny. Also, I think the Instagram link in the rafflecopter is missing the _ in your username. I would love to be able to tell myself to be more outgoing in high school, but then I might not have the life I have now! Very true; we are the sum of our experiences. I have so many things I’d like to tell my high school self! Thank you for your comment! My ears are gauged so I wouldn’t be able to wear those amazing earrings! Just wanted to say I thought they were gorgeous and I can’t wait to read Forget Tomorrow!!! Oh, thank you so much for commenting and leaving me this message! That is so sweet of you — and it makes for a such a lovely start to the morning. Thank you! It would be me sitting in the chair reading a book with my laptop close by and a book on my table with my name on it. I would be in a nice house and it would just look like a comfortable situation. I think I’d want to send the memory of me graduating from college. I had so many times where I thought I wouldn’t finish in my major, and I think it would’ve helped me chill out if I knew it’d be okay. I’d send myself a memory of my successful life and me and my friend living out in the city 🙂 A nice, happy life. probably of my present self to myself in freshman year of college, so I’d have the option of changing some things in my life, if I wanted. I think I’d send a memory to my younger self about my life as a working adult. Maybe they’d appreciate it and get started on it earlier, or completely decide that’s not what they want to grow up to be and completely change the future haha. I’d send myself a picture of my SAT score to tell myself to start studying earlier! I don’t know that I’d send my younger self a memory because I firmly believe that everything happens for a reason, and that the choices we make shape who we are as adults. Even the not so awesome things that have happened have helped me to become who I am. I wouldn’t want to unintentionally, irrevocably change my future. I cannot wait to read Forget Tomorrow! I think I would send myself a memory of how hard I’ve made my life from worrying about what people think of me, trying to be perfect so they’ll approve of me, and basing my worth off of what they think of me. I’d want my younger self to know it’s ok to not be imperfect and have flaws (who are the people in the world to decide what flaws are, anyway?) and that my worth is not based off how others see me, or their opinions. It’s something I’ve struggled with for a long time, and I’ve only just this year started reversing everything and not letting myself fall into that trap. Reading the books “Captivating” by John and Stasi Eldredge (an incredible book!) and “Your Loved No Matter What: Freeing Your Heart from the Need to Be Perfect” by Holley Gerth has really helped too 🙂 It would be great to have learned those things early on, but then – maybe I wouldn’t be who I am today? Sorry to be quite depressing, but the memory I’d send back is of my younger brother’s death. I’d do anything to change that, of course. I don’t think that I would send a memory. Things could get messy and very complicated. Thanks to everyone for entering! I had great fun on the scavenger hunt, and I hope you did, too!! 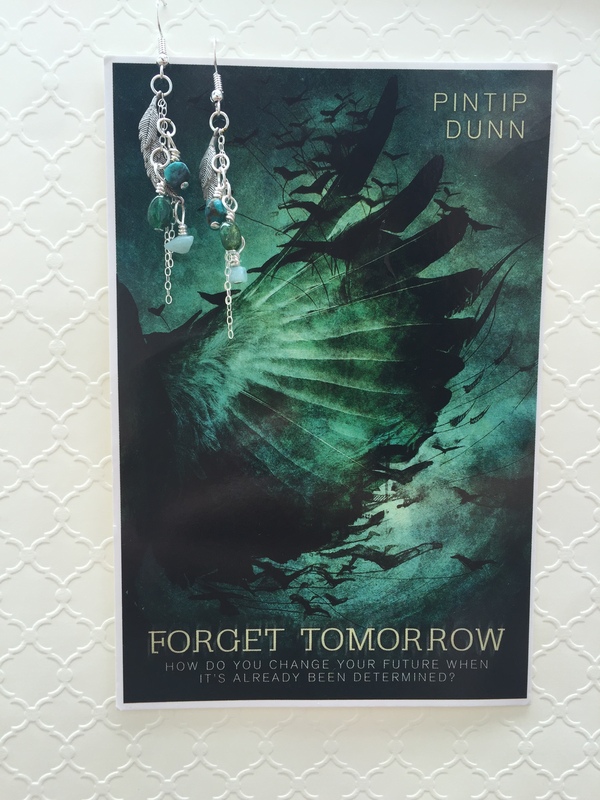 And the winner of the custom-designed Forget Tomorrow earrings is… Megan!!! Megan, I’ve send you a DM to get your address. Thanks again, everyone! Happy reading! I can’t see anywhere to comment on your latest blog post so I’ll leave my answer here. Would love to win the necklace! The item dropped is the syringe. I don’t think I would send a memory to myself. Sometimes it’s best to learn as we go. The book looks interesting. Amber, thank you so much for bringing this to my attention. The comments somehow got disabled, but I have fixed the problem now. Thank you so much for entering, and I don’t blame you for not wanting to send a memory! I agree that it is sometimes best to learn as we go!